UPDATE - Dec. 10, 2012: Public donations have covered the $9,000 cost for the helicopter search. NORTH VANCOUVER, B.C. 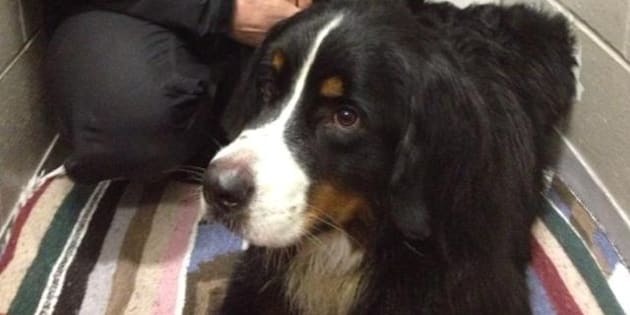 - A Bernese mountain dog that spent almost two weeks on a frigid mountain near Vancouver has been found alive by search-and-rescue crews. The dog, named Ohly, disappeared on Nov. 25 while out for a walk with a family friend on Mount Seymour in North Vancouver. North Shore Search and Rescue have been using a helicopter to look for the dog, after they became concerned that members of the public were putting themselves in danger by searching out in the rough terrain. Search-and-rescue crews spotted the dog from the helicopter Saturday morning and the animal was found alive a few hours later. Search-and-rescue team member Tim Jones says his group covered the cost of the helicopter, but they family has asked for donations to help cover the bill. Jones says the dog appears to be in good condition, but a veterinarian will examine the animal to determine if it suffered any injuries during its time on the mountain.